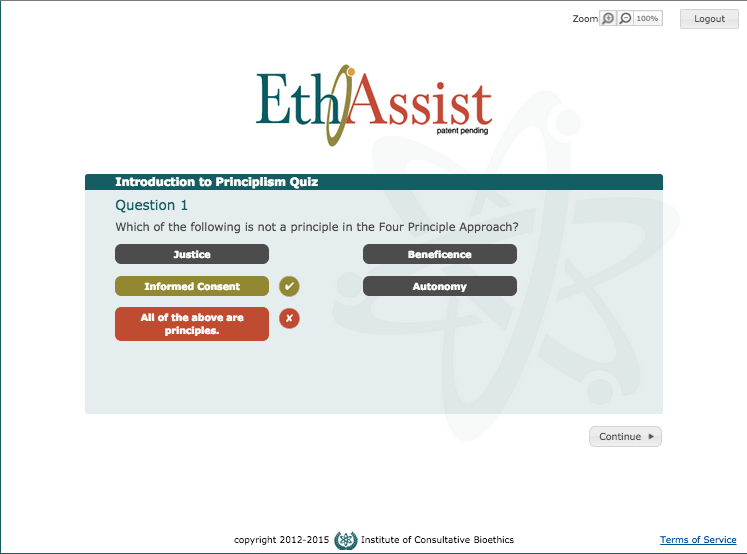 Built upon our e-learning platform, EthAssist, our tools provide integration, application, tracking, and oversight of this knowledge for daily use in many types of organizations, facilities and classrooms. Think of Knowledge as a digital library of content. Those in charge of training use it as a planning tool for easily viewing all reusable learning objects (RLOs) available for instruction. Instructors can review each piece to determine its relevance and suitability for their class or immediate training needs. Employees or students use it as an easy to access refresher tool in their daily practices, or as additional enrichment to their assigned classes. Users can quickly search for relevant content where and when they need it on any of their smart devices or computer. This tool allows individuals responsible for education and training to build a customized curriculum or modify an existing one by selecting from their own information or from hundreds of ICB’s existing RLOs. Much like building with Lego blocks, lessons are constructed using any number of RLOs in any manner required. Also within Curriculum Builder is the logistics center that allows EthAssist to mimic the client’s organizational structure. This provides the ability to track accountability from initiation through completion based upon key performance indicators (KPIs). 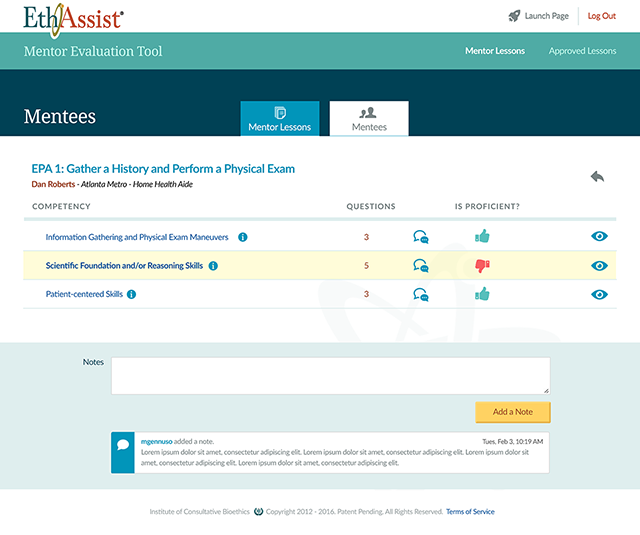 Administrative tools can be used within EthAssist, as well, to add users, assign lessons, and conduct audits. This allows users access to take an assigned lesson. Once a lesson is created and assigned, it is available in MyLessons for users designated to take the lesson. Assessment modules for all subject matter are included in lessons, as chosen by the instructor or individual in charge of training, and are scored with a numerical grade. A record of the user’s lesson activity is stored and accessible to the appropriate person(s) in the organization responsible for initiating the lesson or tracking the user’s progress. This tool provides operational and strategic analysis of an organization’s data in EthAssist. Based upon privileges, users of EthAssist can quickly visualize their current position, validate whether they are making goals or falling behind, and correct their course, if needed. Dashboard provides daily reinforcement, boosts confidence, and increases job satisfaction as staff can see results of their efforts. It helps to create a consistent source of truth across an organization, as everyone—from execs to frontliners—can view the same data. When information is consistent, reliable, and accessible, all can speak the same language, promote system-wide standards of behavior, and collaborate on implementing improvement initiatives. 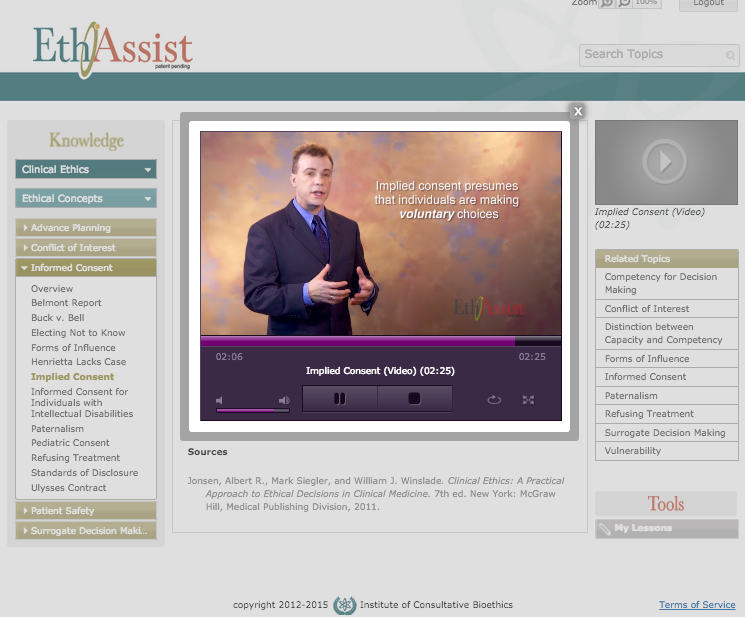 EthAssist’s scenario-based simulation tool helps users learn content and practice skills by virtually participating in realistic situations that dramatize sometimes confusing aspects of their professions’ roles and expectations. EthiSim interactively guides students to develop knowledge, skills, attitudes, and decision-making strategies without exposing others to unnecessary risks. Students gain confidence while repeating scenarios as needed to master the targeted skill or procedure. Instructors who use EthiSim™’s scenarios as springboards for discussion lead students to identify and scrutinize their biases or pre-conceived ideas. This gives students the opportunity to pro-actively formulate plans to prevent or resolve potential problems common in practice—all under the guidance of their experienced instructor. This simulation-based training streamlines collaborative, interprofessional training, too, and makes it more meaningful, as it can be linked to targeted competencies, learning objectives, and assessments. Teamwork training conducted in the simulated environment enhances traditional didactic instruction, helps to build cooperation and competency, and could likely reduce preventable, future errors. This framework lets an experienced professional (the mentor) create a record of professional guidance and practical knowledge and skills shared with a new employee, student, or mentee, as well as the mentee’s progress, during that individual’s career development or during a critical transition, as decided by the organization. This component is both a simulation based training tool and automated methodology designed to guide patient interviews and ensure that all pieces of information pertaining to demographics, family relationships, patient condition, and details of the ethical situation in question are understood, correctly expressed, and documented. IRBQA is an automated guide to walk Institutional Review Board members through the appropriate process as outlined in their IRB Handbook. The tool requires users to respond to each question specific to the particular trial under review. It is self-documenting, providing a report of outstanding responses while noting who responded to the questions with a time and date stamp. This provides a complete record of the IRB’s oversight and actions to preserve the quality and integrity of research. This record can then be stored in future defense of decisions made throughout the process.